I remember Russel Peter, the comedian who said that even in his most ignorant state he wouldn't waste time watching a Bollywood movie. I am not against what he said. A lot of today's Bollywood movies and music are capable of bringing your I.Q down. But I am sure Russel would go back on his words had he seen this off-beat Bollywood movie. It is called "A Wednesday". Just an hour and a half long it doesn't take three hours or more of your time like the usual Bollywood ones. 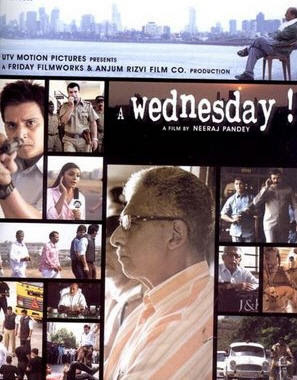 "A Wednesday" is a feather in the cap for director Neeraj Pande who also roped in two veterans of our Hindi film industry, Naseerudin Shah and Anupam Kher who give some great performances. So has Jimmy Shergill and rest of the cast and crew. Editing is crisp and the action fast paced. But the beauty of the movie is that Neeraj has voiced not only his but the feelings of many of us Indians. An intense 10 minutes of dialogue between Naseerudin Shah and Anupam Kher towards the end of the film summarizes this feeling. Writing anything more will be simply giving the movie away. Watch it at any costs.